Former Information and International Relations Kalon Dicki Chhoyang. (TibetanReview.net, Mar01’16) – The Information and International Relations kalon, or minister, of the exile Tibetan administration at Dharamshala, India, has resigned from her post on Feb 28, citing her continuance on that post as a handicap to her ability to participate in public debates on the ongoing Tibetan general election. 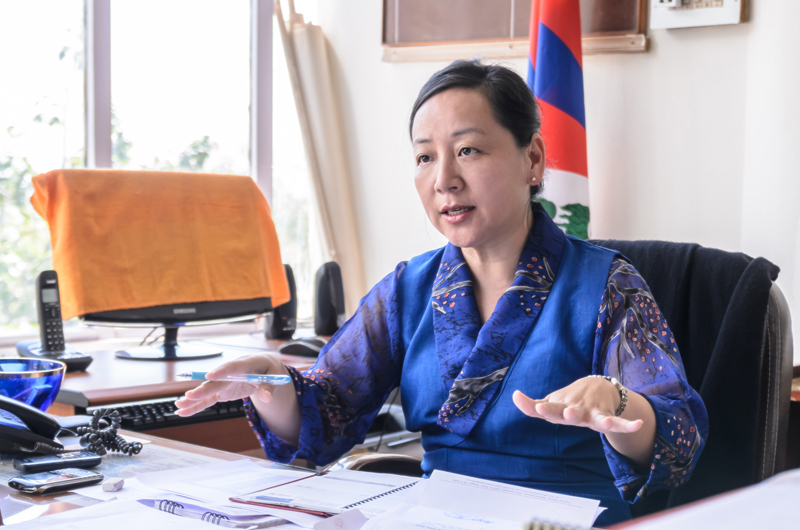 The exile Tibetan administration said on its Tibet.net website Feb 28 that her resignation was sudden and that Sikyong Lobsang Sangay had taken charge of her post with immediate effect. It said the outgoing Kalon, Ms Dicki Chhoyang, had cited her desire to devote her time on major issues facing Tibetans while giving her resignation. Ms Chhoyang, 50, is not a candidate either for the Sikyong post or for a seat in the exile Tibetan parliament and has said, according to Phayul.com Feb 28, that she will, in detail, explain the reasons for her resignation in the near future. However, the Tibetan service of Voice of America Feb 29 cited Sikyong Lobsang as saying Ms Chhoyang had resigned to participate in public debates of the ongoing Tibetan general election since the rules of the Election Commission of the Central Tibetan Administration does not allow incumbent Kalons to participate in election activities. Even more than 48 hours later it is difficult to digest the sad news of your sudden resignation. You could have been a big face of CTA being minister of both International Relations and Information, perhaps the most important department in quest for Tibet’s struggle. Your abrupt resignation in the wake of election is a matter of concern as to what transpired your resignation and raises number of questions in public mind. We don’t want to take your resignation as weapons of supporting or countering any Sikyong candidates. However, the fact that the resignation came during such volatile electoral atmosphere raises doubts, misgivings n street talks that could hardly be trusted as reliable unless clarifications or resounding statements come from your esteemed Kasur’s side. We are after all thankful for your services in the past and of course as Kalon. Your educational quality and valuable experience are always motivation n inspiration for us. We wish you all the best in every field and hoping to see the clearing of air caused in the aftermath of your resignation.